To modify an existing product, click once on the gallery to begin working with the gallery. Click a second time to choose the specific product you want to edit. 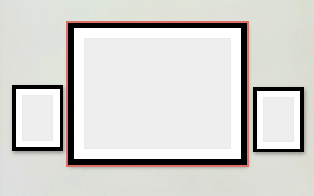 You can change the width of the actual frame, and the width of the actual mat in increments. You can also change the colors of frame and mat. These options will not be visible if the product is an unframed product (standout, canvas, metal, wood, etc.). Please note the size of the product corresponds to the print size, not the overall product size. In the above picture, the overall size of the large framed product is 39x49 (30x40 print, plus 1.5-inch frame on each side, plus 3-inch mat on each side). Clicking on this will allow you to take product specific actions (such as for a canvas product you can switch the edge type) or convert to another product type. Note: you may only convert to other product types that have a matching size available. 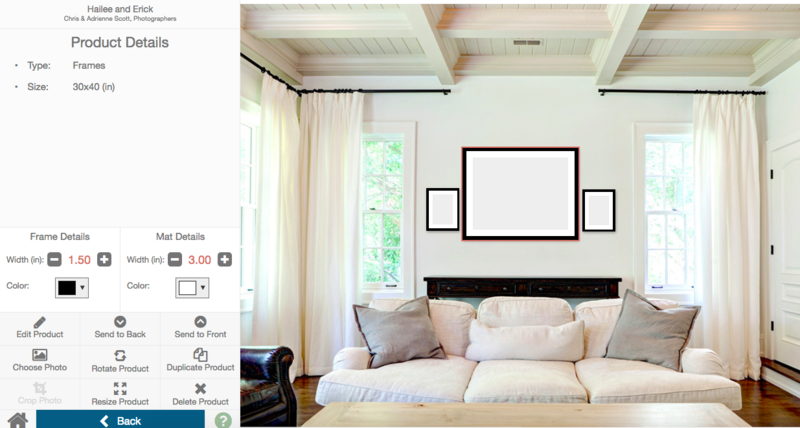 You can change the order in which products overlap in a gallery. You may choose a photo for the given product. Much like rotating the entire gallery, you may rotate an individual product 90 degrees. Please be aware that you will lose any crop that you have applied as you will move the product from vertical to horizontal (portrait to landscape) or vice versa. If you want to quickly add several of the same type of product, this will create a duplicate so you can skip the adding a new product workflow. You must choose a photo first. Once you've chosen a photo, you may crop it. If this is the correct product type but you want to change the size, choose this option. If you want to remove this product from the wall, choose this option. Special Note: Many of the above actions also have corresponding keyboard shortcuts.